Mark Shuttleworth announced, 31 October 2011, that by Ubuntu 14.04, Ubuntu will support smartphones, tablets, TVs and smart screens. The Ubuntu platform for phones was unveiled on 2 January 2013. 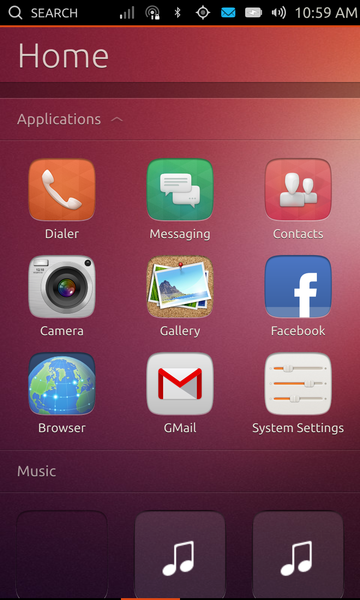 The Ubuntu Touch Developer Preview was released on 21 February 2013. Ubuntu Touch Developer Preview 13.04 on a Galaxy Nexus, the Welcome screen displayed. Canonical released Ubuntu Touch 1.0, the first developer/partner version on 17 October 2013, along with Ubuntu 13.10 that "primarily supports the Galaxy Nexus and Nexus 4 phones, though there are images available for other phones and tablets", and released a relatively "stable" build for wider testing and feedback on 17 April 2014, along with Ubuntu 14.04. A preview version of the software is available for installation on certain additional Android handsets including the Samsung Galaxy S4 Google Edition as a Developer Preview as of 21 February 2013. Developers have access to all of the source code under a license allowing modification and redistribution of the software. Ubuntu Touch uses the Qt 5-based touch user interface and various software frameworks originally developed for Maemo and MeeGo such as oFono as telephony stack, accounts-sso for single sign-on, and Maliit for input. Utilizing libhybris the system can often be used with Linux kernels used in Android, which makes it easily ported to most recent Android smartphones. Ubuntu Touch utilizes the same core technologies as the Ubuntu Desktop, so applications designed for the latter platform run on the former and vice versa. Additionally, Ubuntu Desktop components come with the Ubuntu Touch system; allowing Ubuntu Touch devices to provide a full desktop experience when connected to an external monitor. Ubuntu Touch devices can be equipped with a full Ubuntu session and may change into a full desktop operating system when plugged into a docking station. If plugged the device can use all the features of Ubuntu and user can perform office work or even play ARM-ready games on such device. When Ubuntu Touch is turned on no lock screen is necessary as applications will unlock if needed. The center of the "Welcome Screen" is a visualization of activity on the device. It shows your status and recent events on the welcome screen, completed with an animated design around the circle. Ubuntu Touch includes as core applications social media and media applications (e.g. Facebook, YouTube, and an RSS reader). Standard applications such as a calculator, an e-mail client, an alarm clock, a file manager, and even a terminal are to be included as well. Twelve or more core applications are currently being developed. Several Ubuntu Touch applications work on the desktop, including the Browser, Calendar, Clocks, Gallery, Notes, Reminders, Terminal, and Weather. Side Stage allows to run both "tablet apps" and "phone apps" side by side, resizing each on the top as and when you need to see more of them. It aims to "go even further" with the idea of multitasking, allowing screen space to be divided in this manner. Examples shown in the announcement video included a notes app being used alongside a web browser, and a user swiping from the right edge to bring a mobile version of the Facebook app into view over a playing video. Users can access the whole system by swiping from the edges of the screen. The left edge allows for instant access to applications pinned to the launcher, and swiping all the way across reveals the home, which displays applications, files and contacts. This menu is available from the home screen and any running app. 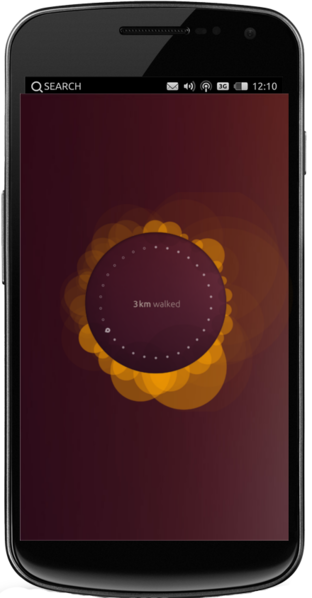 Ubuntu Touch's multitasking is accessed by swiping the finger from the right edge of the screen to the left, which switches to the previous application. Using the launcher on the left side switches back. Swiping up from the bottom side is used to show or hide the toolbar, which gives Ubuntu Phone the ability to run applications with a large, uncluttered canvas by default. Mark Shuttleworth, the founder of the company behind the Linux distribution believes that Ubuntu for phones will first find a niche in countries where Ubuntu is well known; more specifically, developing markets such as India and China where computers have Ubuntu pre-installed. However, the success of Ubuntu Phone in these markets is difficult to predict. Ubuntu strives to be "the smartphone that’s also a full PC". Canonical reports that software for the mobile version of Ubuntu is also compatible with versions for PCs and televisions. This is a feature not currently offered by other operating system companies, and aims to simplify both the use and development of the product. The aforementioned PC and mobile synergy may also be attractive to corporate IT departments currently using Ubuntu to run their servers, as it will extend access to a wider range of devices. This will improve accessibility and the management of devices within the company. Mobile devices can be connected to larger displays and other peripherals such as wireless keyboards. Windows applications can also be accessed from corporate servers onto a mobile device, which makes the transferring of data more efficient. Despite Ubuntu's popularity among open source developers, penetrating the legacy-bound business market will continue to be somewhat challenging for Ubuntu. Companies employing the "Bring your own device" method have already adapted to using Android and iOS devices and the benefits posed by Ubuntu may not be adequately considered. Ubuntu Touch requires that a system's CPU support certain hardware features, specifically the PAE. Adrian Covert, writing for CNN on 2 January 2013, predicted that the operating system will not gain wide use, stating, "carving out a niche in the seemingly unshakable mobile space—ruled by the Android-and-Apple duopoly—still requires a critical mass of users and a lively ecosystem of app developers. Realistically speaking, the chances of this even upstaging Windows Phone or BlackBerry 10are slim. At best, Ubuntu seems like a sandbox for the most enthusiastic early adopters and a cheap enterprise solution for companies on a tight budget." Joey Sneddon of OMG! Ubuntu disagreed with Covert's assessment, writing, "commentators like Covert are missing the point. See, Ubuntu Phones aren't really going to claw much market share away from Apple or Google. And this neat 'dock your phone and use it as a desktop' feature, whilst innovative, won't be the main lure for many […]. During his keynote address earlier this week, Mark Shuttleworth continually referred to 'emerging' markets as the battleground on which an Ubuntu Phone would fight it out for impact […]. It's this sector, the low-end, that the battle for the hearts, minds and hands of the less tech-savvy will take place." Rich Trenholm writing for CNET on 27 February 2013, "[…] But on first impression I'm hugely taken with Ubuntu Touch. It's elegant, thoughtful, and versatile, while remaining beautifully straightforward. […] it's by far the strongest potential rival to Android, iOS, and Windows Phone. In fact, I prefer it to iOS, which long ago lost its shine, and heck, maybe even to Android, too. Fingers crossed that manufacturers and phone carriers get behind it, because I'd happily lay down my own cash for an Ubuntu Touch phone." Jason Jenkins, writing for CNET on 27 February 2013, MWC Awards 2013, "[…] Lots was said about the impressive number of carriers and manufacturers Firefox OS has lined up behind it. But once put to a vote, Ubuntu Touch was the clear winner, with Firefox OS the runner-up. The team thought that Ubuntu Touch, the tablet version of which we got our hands-on for the first time at MWC, feels more like the complete package at this point. […]"
Last updated on 3 November 2014 at 14:57.